…because everyone loves a good story. 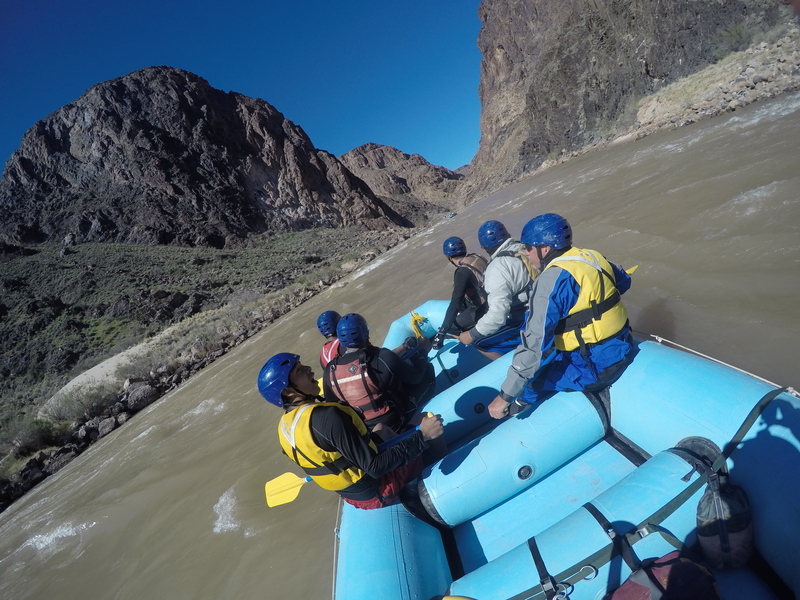 PEACH SPRINGS, ARIZ – Hualapai River Runners and Grand Canyon West, subsidiaries of the Grand Canyon Resort Corporation, are offering one lucky family the chance to win a once-in-a-lifetime guided whitewater rafting trip through the Grand Canyon. 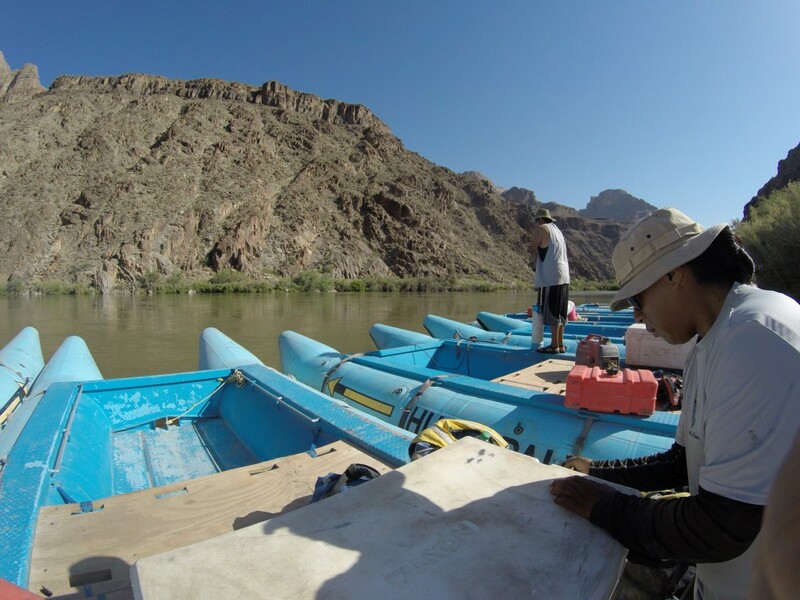 Rafting down the Colorado River ranks high on many adventure lovers’ lifetime bucket lists. Now, thanks to the Hualapai River Runners and Grand Canyon West, one lucky family will soon be able to fulfill this lifelong dream. 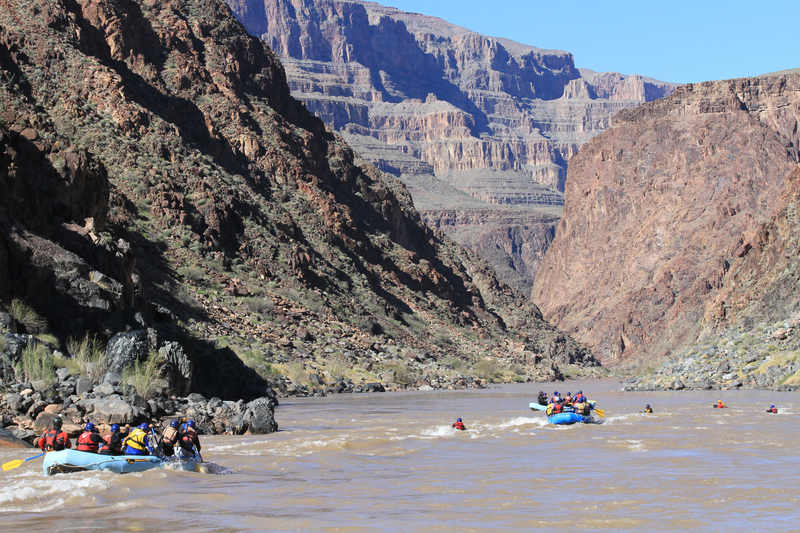 The Grand Canyon West Family Bucket List River Rafting Contest begins July 25, 2016 and ends August 31, 2016. During the contest period, eligible contestants can send a 100-word description detailing why their family (up to four people each over age 8) should be selected to raft the Colorado River as part of a free Hualapai River Runners one-day rafting tour. The trip must be used by October 31, 2016 or it becomes void. Entries can be submitted to bucket@grandcanyonresort.com or sent via direct message to either the Grand Canyon West or Hualapai River Runners Facebook pages. Entries are limited to one per family. A complete list of rules can be found at http://www.grandcanyonwest.com/docs/grandcanyonwestcontest.pdf. An overnight stay for two nights at the Hualapai Lodge on Route 66 in Peach Springs. Transportation to the West Rim of the Grand Canyon. Paddle rafting along the Colorado River’s whitewater rapids. Hike to Travertine Falls for lunch along the river. Paddle trip to Separation Canyon and a hike to the Powell Expedition Plaque. Tour Grand Canyon West viewpoints, including the world-famous Grand Canyon Skywalk. Located just two hours from Las Vegas and four hours from Phoenix, Grand Canyon West offers visitors a variety of outdoor and cultural experiences, including the Skywalk, Colorado River raft tours helmed by Hualapai River Runners certified guides, helicopter tours, and horseback riding. Lodging opportunities include the historic Hualapai Lodge, located on Route 66, and the Hualapai Ranch, with its rustic, western-themed cabins overlooking the Canyon Rim. All the Grand Canyon West tourism experiences pay homage to the culture and history of the Hualapai Tribe, which owns and operates the Grand Canyon Resort Corporation for the benefit of tribal members and the surrounding economy. For more about Grand Canyon West, visit http://www.grandcanyonwest.com/ today. To learn about Hualapai River Runners’ unique one-day and two-day rafting experiences, visit http://www.grandcanyonwest.com/white-water-rafting.html. 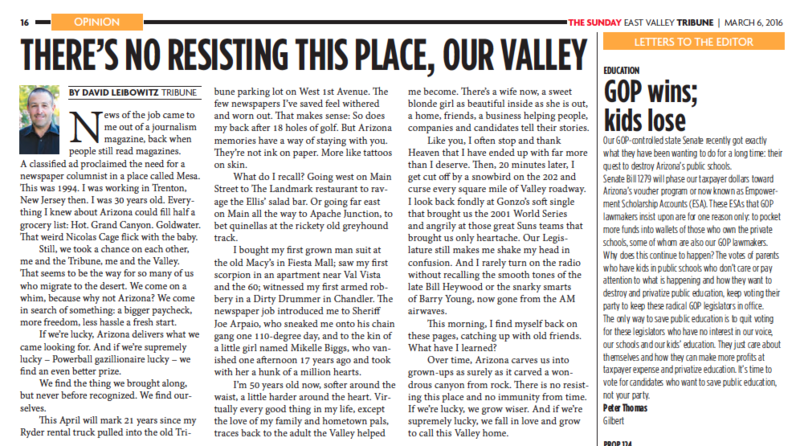 Back home again in the East Valley Tribune … 20 years later. 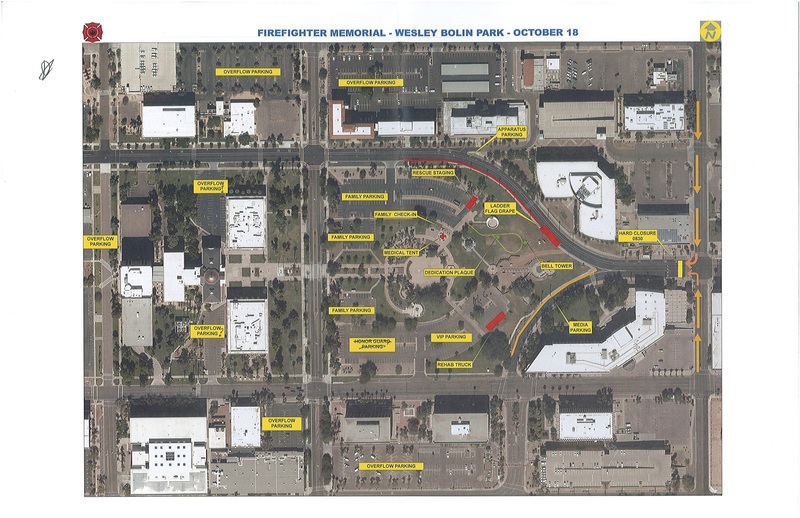 Map of the site of the Sunday memorial. Click to expand. PHOENIX, AZ — Total Transit President Mike Pinckard today praised the Arizona State Senate for its approval of HB 2135, especially Senate Majority Leader Steve Yarbrough and Senate President Andy Biggs, who strongly supported maintaining a level playing field between local transportation companies like Total Transit – which operates both a taxi and rideshare service – and companies like Uber and Lyft. Pinckard also again praised the bill’s sponsor, Rep. Karen Fann, along with House Majority Leader David Livingston, for their dedication in reaching a consensus bill in the House. He noted that HB 2135, as agreed to in the House, preserves Total Transit’s right to operate a rideshare company as it sees fit – without insurance gaps, and by letting its drivers be true independent contractors free to earn revenue in many different ways, not simply through the mobile app. This helps the company recruit new drivers and remain competitive in Arizona’s transportation-for-hire market. “Not only will consumers know our rideshare protects them fully, but our drivers will continue to have the right to pick up street hails, cash trips and any other passengers needing transportation. We pay more for the extra insurance coverage required because we believe that’s a better way to do rideshare. “The worst day in the life and the career of any police officer is the emergency 911 call when he or she must use lethal force. These split-second, life-or-death decisions stay with police officers for the rest of our lives, long after we retire from the Department. “Our Phoenix Police Department colleague, Sgt. Percy Dupra, continues to work through the tragic aftermath of the past few days. So does every member of our Department. Every member of the Phoenix Police Sergeants and Lieutenants Association fervently hopes that our community will respect the investigative process in this case and avoid rushing to judgment in the media and in the street. “The facts of this incident will come out. The investigative process will reach its conclusion. Only once that is complete can our community have a balanced, responsible conversation about public safety and how best to deal with these dangerous, sometimes tragic incidents. Public relations is a waste of money. The subject of the piece is not condemning PR generally, but PR for certain businesses – in this case, small tech startups for whom PR is a big dollar investment that doesn’t pan out financially. As a guy whose business is built around providing public relations advice to everyone from tribal nations to small and big businesses, fire fighter and police organizations to law firms and sports franchises, I absolutely have to agree with that premises … kind of. Public relations is a waste of money. For some folks. I’ve turned down a fair amount of business since starting Leibowitz Solo in 2009, not because it wouldn’t pay well, but because the chances of achieving success were super slim. Prospective clients inevitably show surprise when you explain PR isn’t for them, but they get it once you lay out the reasons why. I need a bunch of customers to show up at my business tomorrow. PR isn’t magic. One story on the 6 o’clock news is unlikely to create a human landslide at your restaurant, shop or local polling place. It’s a noisy world out there; PR pierces that noise over time – a few months or years, not a few days. I am talking to a PR practitioner who says a bunch of customers will show up at my business tomorrow. There’s a term of art I use to describe people like that. They’re “full of sh-t.” The sad part is, in PR just as in the practice of law, the deceitful few give a bad rap to the honest many. I just need someone to write some press releases. Let me let you in on a dirty little secret: Press releases are a lot like junk mail. They get read sometimes … in three seconds, on the way to the trash can or spam folder. No one needs “some press releases.” What you need is someone with a set of relationships that give the releases urgency and a reason to be read. Otherwise, save your money. I’m not sure exactly what will make my business successful. Over the years, I’ve met a lot of folks who don’t need PR – they need a business coach. As someone who has been successful because of a combination of great advice, trial and error and sheer dumb luck, trust me on this: Long before lack of publicity kills your business, not having a plan will. PR, done right, can be a huge boon to a business. But it isn’t for everyone – especially at a cultural moment when social media and uber-cheap digital ads can end run the media and accomplish raising your profile at a fraction of the cost. Anyone who tells you otherwise is pretty much living out that term of art. The Arizona Fraternal Order of Police represents more than 7,500 police officers around the state while our national parent organization represents more than 327,000 public safety officers around the nation. These men and women on the frontlines risk their lives daily to protect Arizona’s communities and to ensure that the American system of justice remains a model around the world. We do our jobs with the realization that not everyone will agree with the work we do, or even demonstrate basic respect for the risks we take and the sacrifices we make. With that said, it’s rare that a candidate for the United States Congress makes a statement as repugnant and offensive as your comments to the Arizona Republic reported on Monday, May 19, 2014. Your reference to Nazi agents in your remarks about the work of Arizona police officers during the 2011 Wallow Fire evacuations – and your statement that you believed officers were willing “to shoot you and me” – is not only unconscionable, but part of a pattern of objectionable and ignorant statements that we believe are a discredit to your candidacy and to the campaign itself. While we understand that you may believe outrageous statements are necessary to do what politicians call “increasing your name ID,” we believe that doing so on the backs of peace officers, immigrants to America and mass shooting victims is beyond the pale. On behalf of police officers across the state and the nation, the Arizona Fraternal Order of Police calls on you to immediately resign from the race for the 1st Congressional District seat. Simply put, you have lost any and all credibility in the eyes of thousands of police officers, our families and the millions of Arizonans who believe in the cause of public safety. It is our group’s understanding that since making these remarks you have issued an apologetic statement through your campaign – a written release in which you sought to give yourself kudos for deciding to “own up to” your misstatements. Frankly, sir, even a child has the good sense to apologize for outrageous conduct. And a child likely would have had the good sense never to make such hurtful statements in the first place. We need adults in office, Mr. Kiehne. For that reason alone, you should terminate your campaign immediately. Today we’re likely to see a battle in the Arizona Legislature over a special set of loopholes meant to exempt billion-dollar ride-share companies like Uber and Lyft from the insurance standards and modest regulations that their competitors in the taxi and limo world face every day. In short, if Uber and Lyft and their lobbyists get their way with HB 2262, the ride shares will not have to carry the same $300,000 primary commercial insurance policy on each vehicle that taxis and limos must carry by law. Additionally, Uber and Lyft will be able to “self-regulate” when it comes to drug tests and background checks for drivers — unlike like taxi and limo companies, who are overseen by the Arizona Department of Weights and Measures. 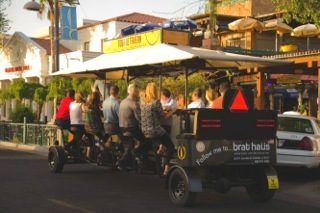 By the way, that’s also a lesser standard than the one faced by “party bikes.” You know … those contraptions you see pedaling around downtown Scottsdale taking partygoers from bar to bar. Here’s a picture, so you know what we’re talking about. Among the legislators voting “yes” on this bill? State Sen. Kelli Ward, who is leading the charge to create loopholes for Uber and Lyft. To recap the logic here: Party bikes which can’t go faster than 15 mph and can’t operate on freeways need at least $300,000 in primary commercial insurance on each vehicle. The state will over see drug-testing and background checks for their drivers. Uber and Lyft, meanwhile, — actual motor vehicles that drive on actual freeways — will be allowed to have $0 in primary commercial insurance on each vehicle, instead carrying only a contingency policy that may cover accidents and injuries, depending on the whim of the insurance company or on a long, expensive lawsuit. As for drug testing and background checks, there will be no government oversight for Uber and Lyft, meaning we’ll just have to trust them. Apparently, the party bike industry needs better lobbyists … or billions of dollars in venture capital to attract more elected friends. Because nothing else explains this ridiculous standard. For more information or for interviews from those who want a level playing field for all modes of transportation, shoot me an email or give me a call at 602-317-1414. I spent two years and tens of thousands of dollars defending myself, my wife and my company from Scott Bundgaard’s absurd claims of a ‘conspiracy’ against him. From Day One, we told Mr. Bundgaard his claims were false and that he would never see a penny from us to settle his bogus lawsuit. On Friday, Mr. Bundgaard dropped his lawsuit and walked away – having proved nothing and having received absolutely not a penny from me or from the City of Phoenix. After voluntarily dropping his lawsuit, Mr. Bundgaard sent out a press statement claiming victory. I want to congratulate him for his historic win, along the lines of Napoleon’s victory at Waterloo, Tom Dewey’s triumph over Harry Truman and the Arizona Cardinals’ many Super Bowl championships. Best of luck to you, Scott. I’m sure your family and friends are very proud. Sacaton, AZ.— Gila River Indian Community Gov. Gregory Mendoza has added his voice to the growing number of Republicans to stand behind American hero Sen. John McCain. 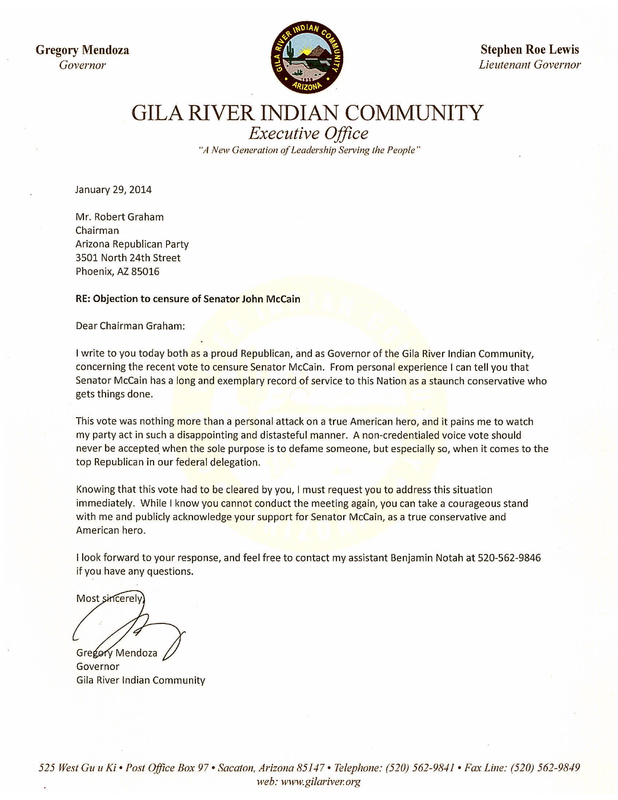 In a letter Wednesday to Arizona Republican Party Chairman Robert Graham, Mendoza condemned the censure of McCain passed by the state Republican party over the weekend. “This vote was nothing more than a personal attack on a true American hero, and it pains me to watch my party act in such a disappointing and distasteful manner,” Mendoza wrote to Graham. Mendoza called on Graham to publicly voice his support for McCain, as have a number of other Republicans. Mendoza said he hopes the growing number of Republicans standing next to McCain will spur party leadership to repudiate the action taken last week.